Chinese do most of the decoration for the Spring Festival on New Year&apos;s Eve, although people begin to decorate their houses around 10 days before. Almost all decorations involved the color red and lucky images. 2019 is a year of the Pig, so pig decorations will appear. 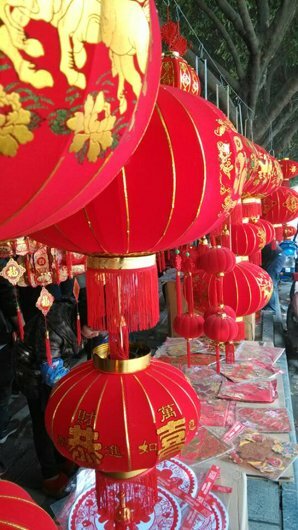 Red lanterns are most popular decorations for Chinese New Year. 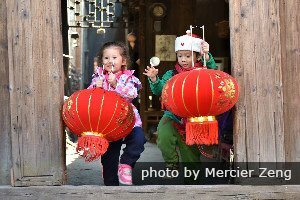 Chinese lanterns are used in important festivals such as the Spring Festival (Chinese New Year to the Lantern Festival) and the Mid-Autumn Festival. 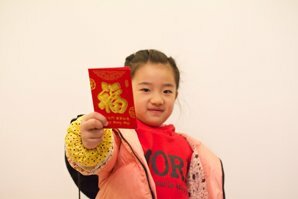 See How to Make a Chinese Lantern from Hongbao (Red Envelopes). 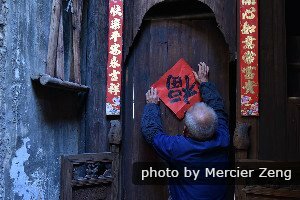 New Year couplets (对联 duìlián /dway-lyen) are pasted on doors. On the couplets, good wishes or statements are expressed. New Year good wishes are usually posted in pairs (i.e. couplets), as even numbers are associated with good luck and auspiciousness in Chinese culture. Couplets are brush works of Chinese calligraphy, in black ink on red paper. The two usually-seven-character lines of the couplet are affixed on the two sides of a doorway. Many are poems about the arrival of spring. Some are statements about what the residents want or believe in, such as harmony or prosperity. These might remain up until renewed at the next Chinese New Year. In the same vein, a four-character idiom of well wishes is often added to the crosspiece of the door frame as well. Click to learn the Legend of Why Spring Couplets Are Pasted. It is a custom to paste paper cutouts on windows during the Chinese New Year. Paper cutting is the art of cutting designs out of paper (any color, but typically red for the Spring Festival), and then gluing them to a contrasting backing or a transparent surface (e.g. a window). It is customary for people in northern and central China to paste red paper cuttings on doors and windows. The image of an auspicious plant or animal typically provides the theme of the New Year&apos;s paper cutting. Each animal or plant represents a different wish. For example, the peach symbolizes longevity; the pomegranate, fertility; the mandarin duck, love; the pine tree, eternal youth; the peony, honor and wealth; while a magpie perched on the branch of a plum tree presages a lucky event that will soon happen. New Year Paintings (年画 niánhuà /nyen-hwaa/) are pasted on doors and walls during the New Year for decorative purposes and as a symbol of New Year&apos;s greetings. Images on the paintings are auspicious legendary figures and plants. Similar to New Year couplets, and sometimes as paper cuttings, is the pasting of big diamonds (squares at 45°) of paper calligraphy with the inverted Chinese character 福 (fú /foo/) on or over doors. The fu characters are deliberately inverted. Fu means &apos;good fortune&apos;, and posting the character upside down means they want the &apos;good fortune&apos; to "pour out" on them. The right side of the character was originally a pictogram for a jar. So by upturning the character implies they&apos;re "pouring out" the jar of good fortune on those coming through the door! 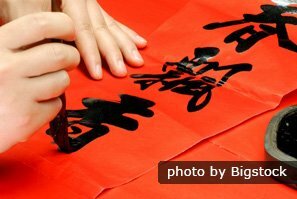 One Chinese New Year&apos;s day (the exact year is not known now), a family attached their 福 (fu) upside down as a careless mistake. On the first day of Chinese New Year, their first guest came to visit, and saw the upside-down 福, and kindly shouted to them: "你们的福倒了!" (&apos;Your fu is upside down!&apos;). 倒 (dao /daoww/) means &apos;to invert&apos;, but also means &apos;to pour out&apos;. So "你们的福倒了" could be understood as ‘Your fu (blessing) has been poured out’. People liked the alternative meaning so much that they started fixing their fu decorations upside down to "invoke" a &apos;pouring out&apos; of blessings. In Cantonese, the kumquat is called gam gat sue. The word gam (金) is the Cantonese word for &apos;gold&apos;, and the word gat sounds like the Cantonese word for &apos;good luck&apos;. Likewise in Mandarin, the kumquat is called jinju shu (金桔树 jīnjú shù /jin-jyoo shoo/), and the word jin (金) is the Chinese word for gold. The wordju not only sounds like the Chinese word for &apos;good luck&apos; (吉 jí /jee/), but also contains the Chinese character if written 桔. Therefore, having a kumquat tree at home symbolizes a wish for both wealth and good luck. 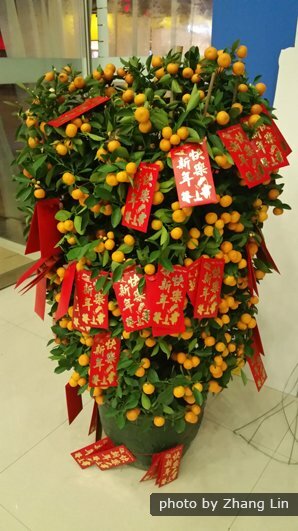 Kumquat trees are a very popular plant displayed during the Chinese New Year holidays, especially in South China&apos;s Cantonese-speaking regions of Hong Kong, Macau, Guangdong, and Guangxi. 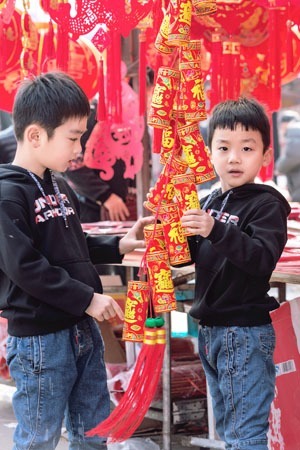 Chinese New Year, also called Spring Festival, marks the beginning of spring. It is not uncommon to decorate houses with blooming flowers, which symbolize the coming of spring and wishes for a prosperous new year. The most popular blooming plants traditionally used during this period are: branches of plum blossoms, orchids, peonies, and peach blossoms. Plants and flowers are extremely popular in Hong Kong and Macau as Chinese New Year Decorations. 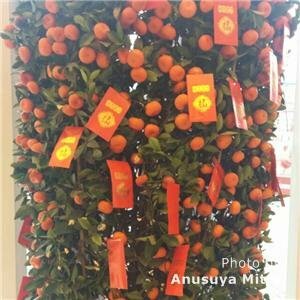 See more on Chinese New Year Flowers and Fruits.